The galleries were big, especially considering the unsettled weather, and they watched very good and compelling golf that was capped by a great final round. 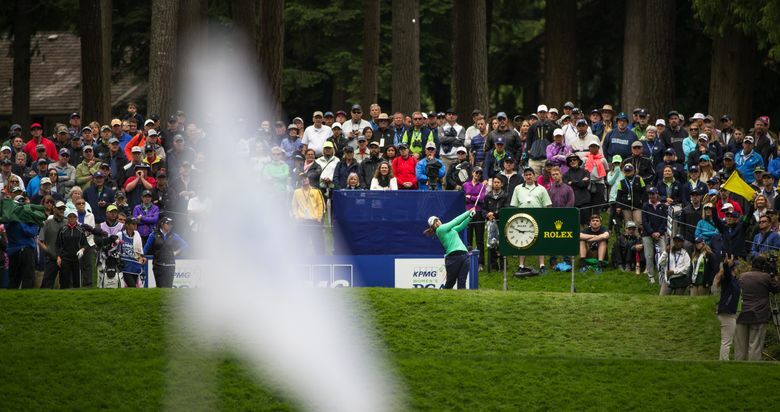 SAMMAMISH – The weather didn’t always cooperate, but just about everything else went right at this week’s KPMG Women’s PGA Championship. It was the first time I have covered an LPGA event, and the level of play was better than I expected. Don’t let the lack of low scores fool you. That was indicative of how tough Sahalee Country Club was and not an indictment of the players. It felt like the U.S. Open last year at Chambers Bay, but with much more accessible viewing, and none of the incessant player griping that became a story line at the Open. And once again, Sahalee proved to be a great venue for a major championship. Even without golf, it’s a walk worth taking. Throw in some great golf, and it’s the place to be. Not everything was quite as promised. The LPGA claims its tour is different from the PGA Tour in how its players are much more interactive with fans, always ready to smile, and to show appreciation. I saw little of that. I saw players rarely even looking at the gallery. Most players gave autographs, but no more than what you would expect at a PGA Tour event. But that’s OK. The great golf this week stands on its own. And I bet there are very few fans who left feeling cheated. So how about doing this again in five years or so?